Deemed the newest powerhouse of Route 19 by Ashley MacIsaac, Joe MacMaster has quickly risen up the ranks of the Cape Breton music scene in the last while. 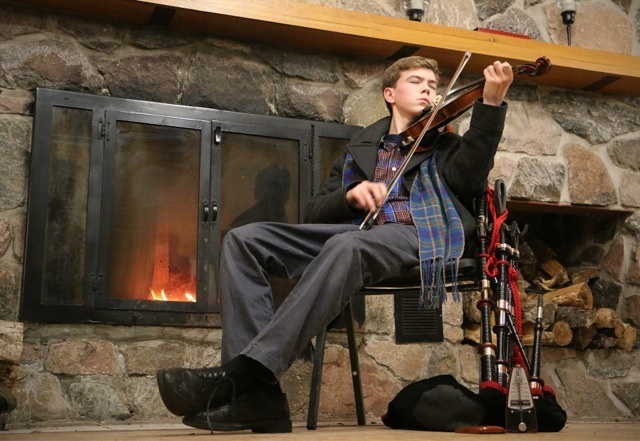 With an arsenal of pipes and fiddle, Joe is a regular at dances and ceilidhs in and around Inverness County. He has also been to Ontario to perform. Hailing from Troy, Joe is nephew to Natalie MacMaster. He credits his aunt Natalie as the greatest influence on his fiddle playing, as well as his deceased grand uncle Buddy MacMaster. On the piping side, Joe credits Kenneth MacKenzie as his biggest influence. He performed in Kitchenfest during 2015, as well as in Celtic Colours that fall. Joe was a member of Na Gaisgich Òga, and Féis Cape Breton, two programs geared towards developing Gaelic fluency, and traditional music in Cape Breton youth. With such diverse talent and familial legacy, Joe is a proud addition to this years Broad Cove Concert.